The net starts back tonight proper for the summer, I hope to make the contact with you. Thanks to those who called in tonight & being the ears where you are. There were lots of stations down at noise level but too weak to work, maybe next time. Join us for the Clyde valley net this week. As always the AM net will follow on at 9pm with the Zello net from 10pm. Here's a diagram of the new cable to connect your FTM100/400 to a pc to use wires-x without the need for the HRI200 interface. The firmware is out for updating the radios too, see video for info. Clyde valley net returns next week. The Clyde valley net returns for the 1st net of the year next Friday 22nd Feb 2019 at 8pm. As usual it will be followed by the AM net from 9pm. 11m operators be on guard Sunday, Monday & Tuesday evening for some aurora propagation. Network radio such at the two models shown below have become very popular over the past year in the UK. Operators are using the communications apps such as Zello, echolink, teamspeak & broadnet. 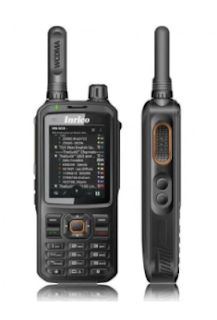 There are many channels on zello that both licenced and unlicenced operators use together ''Radio Network'' & ''Network Radio'' being the two most popular at time of writing, there's even a section in the ''Radio user'' magazine dedicated to network radio now. I find using echolink & zello to be very good on them as these apps tent to be heavy on a mobile phone battery but the T320 has a very good capacity one. You can expect to pay £170 for T320 and £140 for TM-7 new at this time. The devices can take a cellular sim card with data plan or you can tether from your home broadband or from your mobile phone when your out mobile. The T320 handie is a phone too with dual sim card slots & a micro sd card slot, but the screen is very small and not very user friendly but hopefully over time this will be improved.